I would like to know if this endgame is winnable for white. Black to play. Endgame remains a draw, but there was a mistake in my analysis-I hereby thank member DagOskarMadsen for pointing it out. I have updated my answer with the proper drawing move, and have left the bad variation as a sideline and marked it with ?? so it can be noticed more easily. I have also more thoroughly analyzed other sidelines which can be seen in my updated comments-some of the variations are highly instructive. I again apologize to viewers of this post for my mistake. I just had a hunch that Black can make a draw based on his strong king-so I had to try finding a solution again. I will post my findings in the section with variations. Also, I will leave the old variations so previous comments will not become useless. Edited analysis and the final conclusion in response to member's DagOskarMadsen comment. The most obvious characteristic is that White has a knight for a two pawns. However, that knight is so badly positioned. It blocks Blacks pawns, but it is a weak knight rather than good one. Why? What is the difference between this knight and a good one? A good knight can block the pawns and support the execution of the overall plan-this knight can not do that since Black's pawns will queen if he leaves them unchecked. Whites king is weaker than Black one. Whites g5 pawn has achieved maximum efficiency-tying down the entire Blacks king side, but e3+f2 pawns are weak and are restrained by one Black pawn. As for Black, he has achieved maximum efficiency on the queen side, he can not advance further since he has no entry points. His e4 pawn has achieved maximum efficiency as mentioned before ( this pawn also takes away d3 square from the White king which is important for Black's defense-it reduces Whites options for zugzwang, disables White king from penetrating to the king side, and disables White from reorganizing e and f pawns for proper defense ). Black pawns on a4 and b3 tie down to defense both king and knight and have achieved maximum efficiency at this moment. Black has advantage on the queen side, but can not capitalize on it. In this situation it is usual to trade this advantage for the new one-Black will trade queen side advantage ( a and b pawns ) for the initiative on the king side. White needs to improve his knight's position in order to win. Knight should stop Black's counter-play by cooperating with his pawns, allowing king to take all of the Black's pawns. Ideally, White will block the entire position and use zugzwang to take Black's pawns one by one. 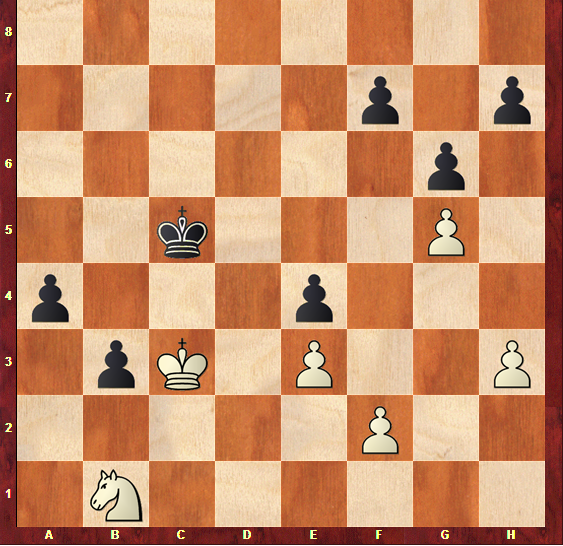 White will need to remove black a and b pawns in order to be able to free the knight to execute the above plan. To do that White will lose 4 tempos-he will need to play Kb4+Kxa4+Kb3+Kxb2 since Black will surely play b2! as soon as he loses a pawn. Why? Because if he does not, White will lose only one move to take the b pawn by playing Kxb3 but after b2! he will need two moves to do that-Kb3 and Kxb2. In this position every tempo counts since both sides race to reach the king side first. We also know that it is Black's turn to move so this adds another tempo. With 5 tempos ahead, a stronger king, pawn weaknesses and holes on the light squares-especially one on f5-we can safely evaluate that Black will be able to fulfill his plan- but whether White will have time to improve knight's position and to win the game requires precise calculation and a strong endgame technique. 14.Kf3 is the only move that draws. The point is that in all variations Black is able to create sufficient counter-play with the h-pawn which results in White being forced to give up knight for him ending in a drawn pawn end game or Black simply manages to exchange all pawns. All the positions were checked with tablebase from this site, so when I put =, it means that I have consulted the tablebases as well. I also fully stand behind my evaluations, so if anybody has a question or a comment feel free to ask/comment-I will respond as soon as possible. The above sample is good enough to give the reader an idea how to save the game. The rest is omitted in order to preserve space. This was the old calculation and is left for the sake of not making previous comments ( especially one made by the member DagOskarMadsen ) useless. Also, I believe that the variations are highly instructive. 1...Kd5 2.Kb4 Ke5 3.Kxa4 b2! 4.Kb3 ( 4.Nd2 Kf5 5.Kb3 b1=Q+! 6.Nxb1 Kxg5 7.Nd2 f5? +- 8.f3 exf3 9.Nxf3+ Kh5 10.Kc4 g5 11.Nd4!+- transposes ) Kf5 5.Kxb2 Kxg5 6.Nd2 f5? +- 7.f3 exf3 8.Nxf3+ Kh5 9.Kc3 g5! 10.Nd4!+- Kg6 (10...g4 11.hxg4+ fxg4 ( 11...Kxg4 12.Kd3+- ) 12.e4+- )( 10...f4 11.exf4 gxf4 12.Nf3+- ) 11.Kc4 Kf6 ( 11...g4 12.hxg4 fxg4 13.e4 Kg5 ( 13...g3 14.Kd5 g2 ( 14...h5 15.Nf5! g2 16.Nh4+) 15.Nf3+- ) 14.e5 g3 15.Kd5 g2 ( 15...Kf4 16.Ne2+! Kg4 17.Nxg3+- ) 16.Ne2!+- ) 12.Kd5 h5 13.Kd6! g4 ( 13...h4 14.Nf3 g4 15.hxg4 fxg4 16.Nxh4 Kg5 17.Ng2! Kf5 18.Kd5 g3 19.e4+ Kg4 20.Kd4! Kf3 21.Ne3+- ) 14.h4! There is not enough space to show all winning moves entirely so I have stopped my analysis as soon as position arising can be solved with tablebases. Hopefully you will understand. Is this endgame winnable for whites? No, it is winnable for White. Again, I apologize for giving you false information, but I believe that the end game is highly instructive and just could not leave it without thorough analysis. Hopefully this answer will help you to learn something new-I know I certainly did! Here's a partial answer explaining why Black should abandon his queenside pawns. However, after 1...Kc6 2.Kb4 Kd5, White can just play 3.Na3 again and the Black king is blocked on the queenside. So whatever Black plays now, he's only idea later will be to go to the kingisde and start taking White's pawns. And it makes sense to say that that idea should be employed as quickly as possible, starting with 1...Kd5 and 2...Ke5. I assume White has a win even if he loses the gh-pawns but I wouldn't trust it without further calculation. Yes. Na3 wins this for white. Black's king is forced back, white's king advances, captures the a4 pawn, and the writing is on the wall for black. The answer would depend on the side to move. If it is white's turn, white wins with Nd2. If it is black's turn, it is a draw, the black king picks up the loose g5 and h3 pawns and then the remaining material in insufficient for a win. It is very dangerous to decide on games outcomes without knowing the side to move. There are positions in which, depending on the side to move, each player can deliver his opponent mate. Not the answer you're looking for? Browse other questions tagged strategy endgame knights pawn-structure or ask your own question. Is this endgame winnable for White? Is this Rook versus Bishop endgame winning for white (white to move)? Is this endgame winnable (for White)? Is this rook endgame won for white? Is this endgame won for white? Can White win this knight endgame? Can white win this Q+P endgame?